Though the plimsoll was the first rubber soled shoe, they were mainly a luxury for the wealthy, and their usefulness never really translated to the general public in England. The rubber in the plimsoll would wear quickly, requiring new pairs after only a few uses. American inventor Charles Goodyear changed everything in 1853 when he patented the process of vulcanizing rubber. By adding sulfur to the rubber at high heat, the cooled product would be a much firmer, more durable form of rubber. As industrialization and urbanization took hold in America by the end of the 19th century, Americans began to experience a shift from a mainly agricultural society, to one of manufacturing. The new wage labor systems of the factories allowed for leisure time that few Americans were used to on the farm. The new manufacturing economy also allowed for the speedy mass production of items that before would’ve taken skilled craftsmen much longer to make. Shoes were no exception, and Charles Goodyear’s son, Charles Goodyear Jr., saw an opportunity to bring his father’s invention into the world of footwear. 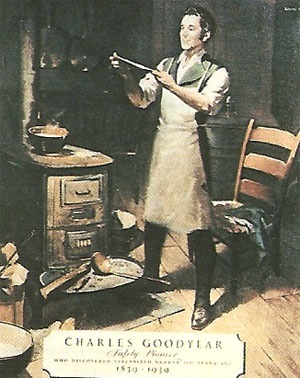 Goodyear took advantage of recent inventions such as Elais Howe’s Sewing machine and Thomas Blanchard’s gunstock lathe and incorporated them into the production of a new kind of shoe. Using Blanchard’s lathe to shape the rubber soles to exact specifications allowed Goodyear to improve upon the “straight last” shoes of the past and create shoes specifically for the right and left feet. After Goodyear’s first few attempts at shoe making failed, he joined his company with several of his competitors to create the US Rubber Company in 1892. From 1892 until 1916, the US Rubber Company created over 30 different kinds of rubber-soled shoes, none of which became successful. Reflecting on their past success in joining their companies, the US Rubber Company halted production of all footwear and went back to the drawing board. Under a unified front one year later, the company released the Keds, the world’s first sneakers. The word “sneakers” was coined shortly after their release by advertising agent Henry Nelson McKinney, since they made it easy to sneak up on someone without the loud footsteps of the more common wood and leather shoes. Though the Keds are considered the first sneakers, Goodyear was not the only one to see the potential in rubberized footwear. Concurrent to the release of Keds in 1917, Marquis M. Converse of the Converse Rubber Shoe Company created what would come to define the rubberized shoe, the Converse All-Star. 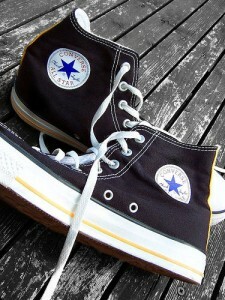 In 1908, Converse began manufacturing rubber soled winter shoes with canvas that covered the lower ankle. With only slight success, Converse decided to market the shoes towards the emerging spectator sports crowd, with great results. Although basketball was still in it’s infancy, crowds were already beginning to gather for professional games and it had already made its way into high school gyms. Converse capitalized on this by convincing Chuck Taylor, the best high school player in America to wear his shoes. Taylor’s endorsement of the shoes was so successful that the shoes themselves were simply called Chuck Taylors, or Chucks for short. The Converse All-Stars filled a niche no one even knew existed, and soon almost every player in the country wore them. Converse probably had no idea his shoes would become synonymous with the one of the greatest basketball players to ever play the game, and become a symbol of the game itself. The shoes became the best selling shoe of all time, with 550 million pairs produced since 1917. Charles McDermott, The History of the Shoe and Leather Industries of the United States, (Boston, MA: John W. Denehy & Company, 1920), 11. Nigel Cawthorn and Angela Pattison, Shoes: A Century of Style, (Glen Bernie, MD: Apple Press, 1998), iv. Abraham Aamidor, Chuck Taylor, All Star: The True Story of the Man Behind the Most Famous Athletic Shoe in History (Bloomington, IN: Indiana University Press, 2006), 17. Chuck Miller, “The Original All Star,” Basketball Digest, Febuary 1999. 21-23.